The art of doctoring store-bought brownie mix is no surprise to most who like to bake. For years now, I have used various ingredients, swapped out liquids, and added spices as well. 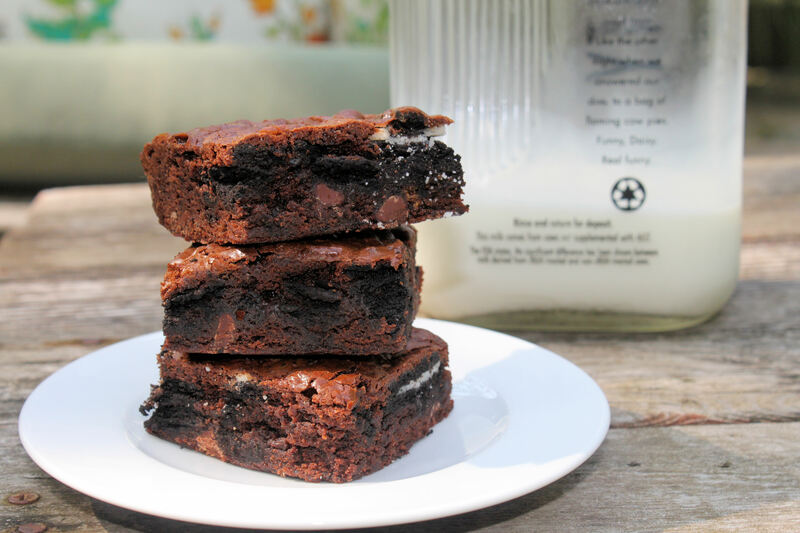 There are many recipes on the web for what has now become a popular brownie, the ‘Cookies and Cream brownie’ with Oreo cookies. Recently I stumbled upon this recipe that not only has the Oreos, but it has the addition of fudge sauce and ice cream. It is almost like having ice cream with your brownie, but this ice cream is within the brownie. To go for the ultimate indulgence, why not serve this decadent brownie with a fresh scoop of ice cream. Either way, these are delicious. There are a couple of small changes in this recipe as I added a touch of salt and some espresso powder. The addition of espresso powder adds a level of earthiness that helps balance out the sweetness. Double the recipe if you want extras. The brownies don’t last! Recipe source: Kevin and Amanda… Thanks for the great recipe! Remove ice cream from the freezer to allow it to soften about 15 minutes before preparing brownies. Preheat oven and lay tin foil or parchment paper in the pan for easier removal, once cooled. Spray prepared pan with cooking spray evenly. Combine brownie mix with the salt and espresso powder. Add the eggs and oil, per package instructions. Eliminate the water. The ice cream and fudge is taking the place of that liquid. Add ice cream and hot fudge to the brownie batter and stir to combine. Pour half of the brownie batter into the baking dish, layer with Oreos, then top with remaining batter. Bake for as directed on the back of the box, between 40-55 minutes depending on pan size and oven. The brownies will be dense but make sure they are baked through. Remove from oven and let cool. For the cleanest cut on a brownie, refrigerate the brownies until completely cool before cutting the brownies. This entry was posted in brownies and bars, comfort food, desserts/bakery and tagged baking, brownie, brownies, Cookies and Cream, desserts, Espresso, Fudge, how to, Ice cream, oreo, recipe. Bookmark the permalink.